Seeking to provide high quality solutions for the power transmission and precision mechanical component industries, Torque Transmission manufactures a line of precision-engineered roller chain sprockets. Used in bicycle chains and many other machinery like vehicles, motorcycles, and tracked systems roller chain sprockets are a wheel with teeth that mesh with a chain, although sometimes they are also run in conjunction with a track or other perforated material. Not to be confused with gears, a roller chain sprocket never mesh directly with other sprockets. With a glass reinforced nylon body, these roller chain sprockets are lightweight, durable, and cost-effective. The glass reinforced nylon body is also rust resistant, providing users with a long, rust free service life. The sprockets are available in a wide selection of teeth from 9 to 48, all 1/4" pitch single sprockets. The hubs are drilled and tapped with #10-24 setscrew and they can be drilled with cross holes for dowel pins. Keyways and D-bores can be molded in the hubs and for greater strength, aluminum hubs are available for sprocket number S-2516 and larger. 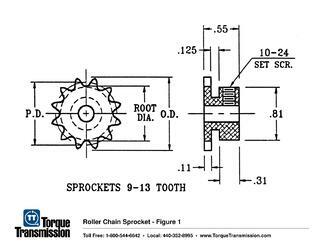 Contact Torque Transmission to learn more about our roller chain sprockets, request a quote, or download our catalog. What are Roller Chain Sprockets? This post was published on October 2, 2018 and updated on October 2, 2018.